Coriolis Flowmeter Archives - Eastern Controls, Inc.
A candy manufacturer with outdated process technology equipment was experiencing an extreme amount of error within their process line. Further, entrained gas was so prevalent in the system that the manufacturer was certain nothing would be able to help. 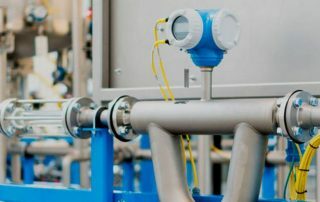 Read on to see how Endress+Hauser's Promass Coriolis Flowmeter solved this company's process line errors! Featured this month: PSS Registration information, Mobile Plant Asset Management, UV/IR Flame Detection, Meet ECI's Trainer, and the Differences between IoT and IIoT. Eastern Controls was just awarded exclusive representation of MSA's Fixed Gas and Flame Detection product lines in Northern New Jersey and Metro New York! Read the press release to learn more. Featured in this month's edition: ECI's Process Solutions Summit, the history of our PSS, a spotlight on combined cycle power, the first part of our three part mini-series on the history of ECI, and what the future holds for the oil industry! TURCK Engineered Packaged Systems (TEPS) provides intrinsically safe paneling solutions for a variety of industries. Learn more about them in this case study! Check out Turck's innovative technology for control - the Field Logic Controller (FLC). Read more about how FLCs can benefit you in this addition of Product Focus! Flame detection is imperative for hazardous environments within petrochemical facilities. Check out MSA's latest flame technology innovation - the FL500 UV/IR Flame Detector! Since 1969, Eastern Controls has been the leading manufacturer representative, distributor, and service provider of process measurement and control equipment in the Mid-Atlantic region. For help with any of our products or services, please reach out to your nearest Eastern Controls customer support representative.